Tulsi tea is commonly known as holy basil tea in the West. The tea originated in India 5,000 year ago. Tulsi is not technically a tea at all because it does not originate from a tea bush. Instead, it is from the same family as basil, and is considered to be an herbal infusion, although it is prepared in the same manner as black or green teas. Tulsi has been called the "queen of herbs" and is integral to the Ayurvedic system of medicine. However, tulsi tea's usefulness in weight loss is tangential at best. Proponents of tulsi tea claim it can strengthen the immune system, prevent heart disease by lowering cholesterol and blood pressure, reduce stress, increase strength and endurance, aid digestion, fight free radicals with its cancer-fighting antioxidants, help the liver, relieve inflammation and fight infection. But the website Learn-About-Tea.com does not include weight loss on its long list of potential benefits of tulsi tea. The Indian system of medicine known as Ayurvedic has long used tulsi tea for health and medicinal benefits. AyurvedicCure.com states that tulsi tea has both antioxidant and adaptogen properties, the latter said to help the body fight stress and balance mind, body and spirit. Traditionally, tulsi tea has been used in Ayurvedic medicine to treat everything from colds to stomach worms to thickening sperm. But weight loss is not among the traditionally claimed benefits of tulsi tea. According to the Organic India website, tulsi tea "strengthens digestion and a healthy metabolism that may promote weight loss." The Fruits n Vegetables website offers a weight loss program that suggests starting the day with warm tulsi water, prepared by boiling 10 tuisi leaves with a bit of ginger. The site states that tulsi may assist in cleaning your digestive system and aid in liver function, which it says plays an important role in weight loss. But no scientific evidence supports such a view that tulsi furthers weight loss. However, tulsi tea might help you lose weight in a few indirect ways. It has no caffeine, which might prevent the jitters from coffee or teas that contains caffeine. It is said to be an adaptogen, which might further soothe the nerves when dieting. And it is low in calories, which makes it a good drink for dieters. 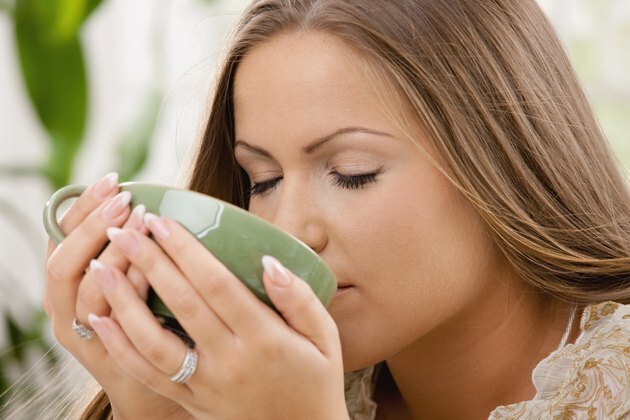 You may derive health benefits from drinking tulsi tea. According to the website Organic India, it is safe for pregnant women and children over the age of 2, although you should check with your health care provider before using any herb or herbal formula. But as the American Heart Association advises, don't fall for weight loss plans that emphasize one particular food or type of foods. "A healthy diet rich in fresh fruits and vegetables, whole grains and fat-free or low-fat dairy products, along with physical activity, can help people manage and maintain weight loss..." according to the American Heart Association.